The Convention respecting fisheries, boundary and the restoration of slaves between the United States of America and the United Kingdom of Great Britain and Ireland, also known as the London Convention, Anglo-American Convention of 1818, Convention of 1818, or simply the Treaty of 1818, was an international treaty signed in 1818 between the United States and the United Kingdom. Signed during the presidency of James Monroe, it resolved standing boundary issues between the two nations. 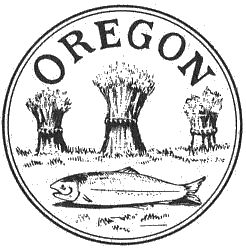 The treaty allowed for joint occupation and settlement of the Oregon Country, known to the British and in Canadian history as the Columbia District of the Hudson's Bay Company, and including the southern portion of its sister district New Caledonia. The two nations agreed to a boundary line involving the 49th parallel north, in part because a straight-line boundary would be easier to survey than the pre-existing boundaries based on watersheds. The treaty marked both the United Kingdom's last permanent major loss of territory in what is now the Continental United States and the United States' only permanent significant cession of North American territory to a foreign power. Britain ceded all of Rupert's Land south of the 49th parallel and west to the Rocky Mountains, including all of the Red River Colony south of that latitude, while the U.S. ceded the northernmost tip of the territory of Louisiana above the 49th parallel. Article II set the boundary between British North America and the United States along "a line drawn from the most northwestern point of the Lake of the Woods, [due south, then] along the 49th parallel of north latitude..." to the "Stony Mountains" (now known as the Rocky Mountains). Britain ceded the part of Rupert's Land and Red River Colony south of the 49th parallel (including the Red River Basin — which now forms parts of Minnesota, North Dakota, and South Dakota — as well as a small piece of modern-day Montana near Triple Divide Peak). 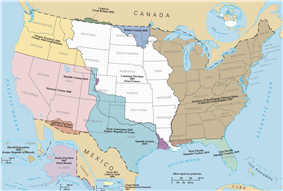 The United States ceded the small portion of the Louisiana Purchase that lay north of the 49th parallel (namely, parts of the Milk River, Poplar River, and Big Muddy Creek watersheds in modern-day Alberta and Saskatchewan). This article settled a boundary dispute caused by ignorance of actual geography in the boundary agreed to in the 1783 Treaty of Paris that ended the American Revolutionary War. That earlier treaty had placed the boundary between the United States and British possessions to the north along a line going westward from the Lake of the Woods to the Mississippi River. The parties had failed to realize that the river did not extend that far north, so such a line would never meet the river. In fixing this problem, the 1818 treaty inadvertently created an exclave of the United States, the Northwest Angle, which is the small section of the present state of Minnesota that is the only part of the United States outside Alaska north of the 49th parallel. 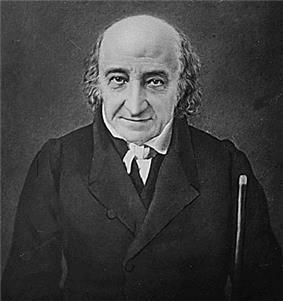 The treaty was negotiated for the U.S. by Albert Gallatin, ambassador to France, and Richard Rush, minister to the UK; and for the UK by Frederick John Robinson, Treasurer of the Royal Navy and member of the privy council, and Henry Goulburn, an undersecretary of state. The treaty was signed on October 20, 1818. Ratifications were exchanged on January 30, 1819. The Convention of 1818, along with the Rush–Bagot Treaty of 1817, marked the beginning of improved relations between the British Empire and its former colonies, and paved the way for more positive relations between the U.S. and Canada, notwithstanding that repelling U.S. invasion was a defence priority in Canada until the Second World War. After the treaty, the area east of the Oregon Territory, along the border was proposed to be organized as the Pembina Territory, but the U.S. Congress never acted on the proposal. Instead the area became the Minnesota Territory and the Dakota Territory. ^ Lauterpacht, Elihu, et al., ed. (2004). "Consolidated Table of Treaties, Volumes 1-125" (PDF). In Edited by Elihu Lauterpacht, C. J. Greenwood, A. G. Oppenheimer and Karen Lee. International Law Reports:. Cambridge University Press. p. 8. ^ a b c LexUM (2000). "Convention of Commerce between His Majesty and the United States of America.--Signed at London, 20th October, 1818". Canado-American Treaties. University of Montreal. Retrieved 2006-03-27. ^ a b LexUM (1999). "CUS 1818/15 Subject: Commerce". Canado-American Treaties. University of Montreal. Retrieved 2006-03-27.